"Some women fear the fire. Some women simply become it." There are as many metaphors for motherhood as there are mothers. Motherhood is a journey many say. Motherhood is a battle say others. Motherhood is a lonely island I've heard it said and a google search says Motherhood is like The Giving Tree. But I say motherhood is a fire. And this fire of motherhood burns. It is not just an inspiring line of Pinterest worthy poetry. No, it's an altering flame, more powerful than you can express to anyone who hasn't experienced it. It breaks apart and refines parts of yourself you thought you needed to survive. It leaves you in recovery longer than you hoped. This sacrificial living that is called motherhood, well, it will stretch you more than you can imagine. It will change you into a woman you may not recognize. This is how I felt for many years. Current culture promotes our 20's and even our 30's, as the decades of self-exploration and discovery, and for me this rang very true. But not in the way most would expect. While self-discovery is often associated with autonomy, my 20's have been marked by the forming of our family. 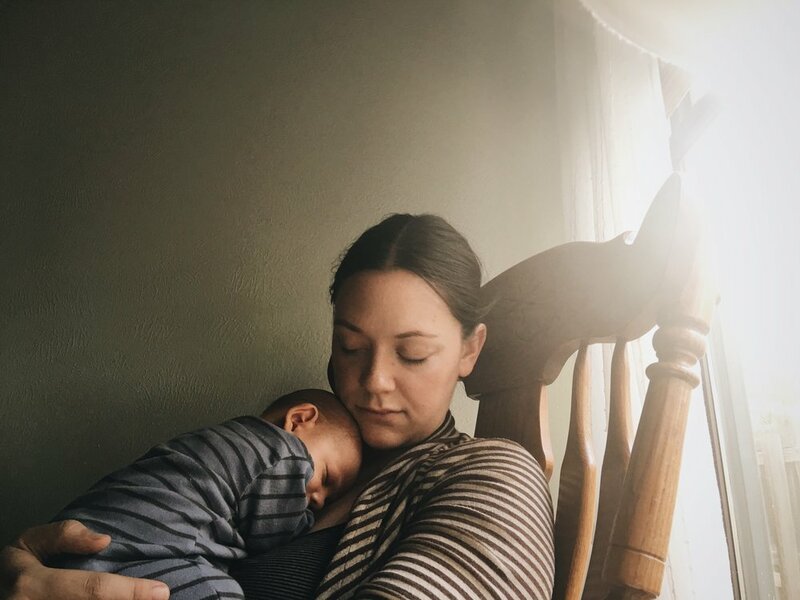 Marriage and babies might have seemed to many like I skipped the season of young self-discovery, but what they didn't know was that motherhood was teaching me about the deepest depths of my self. Motherhood is truly the epitome of self-discovery. The roller coaster of growing our family in my 20's threw me into the fire. But I was not overcome by the fire. I became the fire. I finally became the heroine of my own story. Not by acts of autonomous living, but through acts of service. While some may think I'd have to put off self-discovery for a season of motherhood, it was in motherhood I found myself. While others may say a full knowledge of oneself is necessary before motherhood is attempted, the reality is that all of self is dismantled in motherhood, so perhaps it was better for me to have less autonomy to grieve throughout the process. Because Motherhood is the fire that asks how much are you willing to sacrifice for this life: Will you sacrifice your body? Your comfort? Your schedule and your sleep? Your autonomy? Your sanity? Your dreams or plans? Will you sacrifice your life as you dreamed it or planned it? These questions are the hardest I've ever been asked and they were more daunting than those I asked before children. They made motherhood feel at times like rolling flames coming to consume me. I waited on the safe side of the fire line, comfortable in my routine or knowledge or work, but knowing that as soon as the fire would jump that line - everything would change. Today I bear the metaphorical burn scars of pregnancy losses, grief, sorrow and postpartum depression; of birth: vastly different and seemingly impossible every single time. I've been burned out by the demanding needs of my children, day after day after day and by the emotional toll being a caretaker of such tiny humans can have on a single soul. But I am not just marked by loss, grief, sorrow. I've been deeply marked by the deepest love I have ever known. By the countless hours of nursing, and providing life-giving sustenance. I've been marked by being the only one who can calm the baby, kiss the boo boo, and make everything ok. And I've been marked by how living so sacrificially inspired all other areas of my life, including my marriage, my friendships, and my art. So I wonder, if I'd never been brought to this edge of all I thought I knew, would I have ever discovered my true self if not for Motherhood? Because until you've been asked to sacrifice it all, can you know how truly strong you are? Can you become the fire if you don't bear the visible scars of the fire? Can you become the heroine of your own life if you haven't first laid down all that you thought you wanted out of life? No matter what decade we take on Motherhood and no matter how formed we believe ourselves to be these final questions are the ones that will burn and break us. And then they will rebuild us. I thought maybe I had lost the woman I'd dreamed of becoming all those years ago. It was so hard to keep sight of her over the years through the flames that threatened to consume me. But my dream was a shallow and hazy reflection of the fiery and strong woman who was actually waiting to be revealed all along. She had been inside waiting for everything to be stripped away so she could become. She has been the lifeblood pumping through my veins that brought healing. She is the fierce mama bear, always watching. She is the survivor. She is the nurturer. She is intuition. She is confidence. She is the heroine of this story. And she is finally me. And we are the fire.